The area known as the Bokkeveld, (from the vast herds of Springbok that migrated through in early times) was first permanently by settled by VOC colonists around 1730. Most of the first farmers were from the ‘t land van Waveren that later became known as the Tulbach Valley. The Bokkeveld was divided into two areas the Koue and Warm. This latter area was the land surrounding the top of the Mostert’s Hoek Pass, where Ceres now stands. The Koue or Cold Bokkeveld was the higher lying area to the east and north. The farms in the northern parts were mostly described as being agter de Witzenberg (behind the Witzenberg) this being one of the mountain ranges that separates the Koue Bokkeveld from the Tulbach Valley and was crossed by the Witzenberg Pass. Sometimes however, the farms were described as being over the Oliphants River as this was another route into the area via Kardouws Kloof (crossing into the Oliphants Valley from just above Porterville) and the Elands Pad Pass (a road over the Middleberg). The area was fertile and excellent for growing grain, fruits and vegetables and poultry, especially turkeys. The main activity was the rearing of mutton sheep. In 1805 it was calculated that there were 30 000 sheep in the district. The main advantage was the cold climate, which prevented lamziekte, a prevalent disease at that time. During the coldest periods the farmers took their flocks over the Swartruggens and down into the Ceres Karoo to feed on the winter grass. 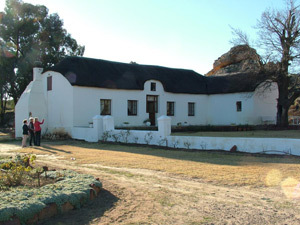 It was always sparsely settled and a good proportion of the white inhabitants were members of the van der Merwe family. As late as the 1820’s this area was considered a remote part of the Cape and at Houdenbeck, in one corner, the last slave rebellion took place in 1823.